Thanks to Powell Street gripman Val Lupiz for providing this interesting article. The ultimate town car, with instant acceleration, fantastic wear index, all-weather traction, phenomenal passenger capacity, and an unmatched degree of customer loyalty. A COMMON ILLUSION AMONG READERS of automobile magazines is that the life of the road tester is one long round of novelty and excitement. Actually, this is far from the truth, because his days are almost entirely occupied in trying to accurately assess the performance and handling qualities of such mundane automobiles as the XK-E Jaguar, the DB-4 Aston Martin and, perhaps, an occasional Ferrari or Scarab. However, the appalling monotony of this work is occasionally relieved by the presentation of a vehicle which, because of its superlative performance and unsurpassed beauty of line, stands head and shoulders above all other machines. 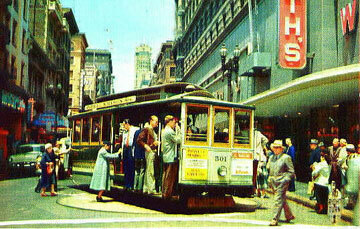 One such vehicle, which was offered to us recently for testing, is the San Francisco cable car. Before giving our impressions of this vehicle, it is necessary to delve rather deeply into the history of the marque in order to ascertain both its origins and its purpose, and to obtain some idea of the unique method of propulsion which is employed. The San Francisco cable car predates the work of Gottlieb Daimler by 13 years, and the first model was introduced in 1873. 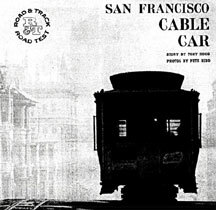 It was designed and built by a Scot named Andrew Hallidie who felt that the problem of transportation in San Francisco, due to the incredibly steep hills, could best be solved by the use of Street cars pulled by a cable running underground at a constant speed. Furthermore. his design incorporated a novel grip mechanism that enabled the operator to engage or release the cable at will, and it is a tribute to his remarkable ingenuity that this system is still running today. Unfortunately, Hallidie’s system was almost totally destroyed by the earthquake and tire of 1906, hut much of it was rebuilt, and there are still two separate lines operating. These lines carry considerable daily traffic, and it is unlikely they will be discontinued in the foreseeable future. The Road & Track editors had a bias in favor of compact cars. 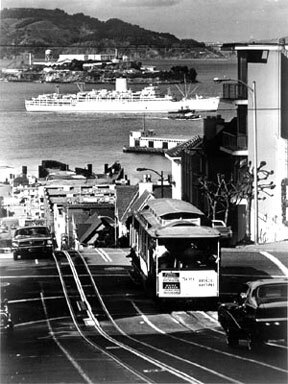 They, therefore, rejected the larger California Street cable cars in favor of the "compact" Powell Street cable car for their road test. 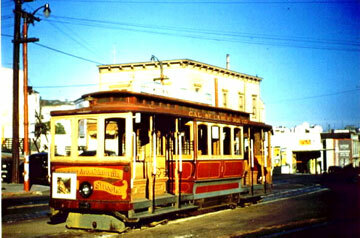 Here a California Street cable car, during the era of private ownership, is at the line's then outer terminal Presidio Avenue, prior to the line being cut back to Van Ness Avenue. Walter Rice collection. The two remaining routes are the California Street and the Powell Street, and it completely different model is used on each line. The California car is much larger and its general dimensions reflect the type of domestic thinking that wits prevalent before the European influence was felt in the postwar years. Therefore, bearing current trends in mind, we selected the compact Powell-Hyde Street model for our test, as we felt that its more progressive design was in keeping with the desires of the readers of Road & Track. Apart from these consideration., the route taken by the Powell car is far more taxing than that taken by the California car, as it incorporates all of the special tests and checkpoints that can be anticipated and successfully completed by the experienced cable car operator. The cable runs beneath the street at a steady 9.5 mph. suspended on an extraordinary system of pulleys which take it tip and down hill and around turns until it reaches the end of the line, where it is returned by a 10-foot sheave wheel. The car itself is connected to the cable through a slot like a third rail in the center of the tracks, and the grip projects down through this slot to make contact with the cable. The grip is the heart of the cable car, and it is a most ingenious mechanism. A complete unit in itself, weighing 260 lb. it can be removed from the car and replaced in a matter of minutes. It is actuated by it long lever which, when pulled retracts a yoke, lined with replaceable steel dies, around the cable, and it grips so strongly that there is no slippage at all. Because of this device, a cable car operator is always referred to as a gripman. A cable car is operated in a standing position and, on taking our place at the controls, we found ourselves confronted by three levers, with a vertical foot pedal in the floor just behind us. The three levers project from a great hole in the floor of the car, which we felt was a very bad design feature as it subjects the gripman to an unhealthy draft while the car is in motion. However, we realized that the ill-effects of this are partially offset by the heat-inducing physical energy expended by the gripman while operating the controls. On the other hand, we were immediately impressed by the rugged construction of the controls. In an age when emergency brakes hide in shame under the instrument panel it was pleasant to observe that these levers, each five feet long, obviously had been beaten out of red hot steel by old-world craftsmen with sledge hammers. To set the car in motion, the hand brake is released and a strong pull on the grip lever takes up the permissible free-play of about two feet until the grip starts to take hold. The car will then slowly move forward, and a further, and stronger, pull locks the grip to the cable and brings the car up to its cruising (and maximum) speed, of 9.5 mph. To stop the car, the grip lever is thrown forward to disengage the grip, and the hand brake lever pulled on. The hand brake operates by forcing wooden blocks down directly on the rails. Soft pine is used and the shoes have to be relined every three days. An added attraction of this system is that one sometimes descends Nob Hill accompanied by a strong, and quite delicious, smell of barbecuing. The controls, which fall readily to hand, are laid out with the grip in the center, the hand brake to the right and another lever to the left. which is painted red and is a sort of panic button for use when everything else fails. When pulled, this lever forces a steel wedge down into the slot this is so effective in stopping any forward motion that it usually has to he cut out with a torch. Apart from the pine blocks, there are two other independent braking systems. The conductor, who is normally engaged in the rather mercenary task of collecting 15¢ from each passenger, engages railway type brakes on the rear wheels when the car is descending steep hills, these being operated by a hand crank on the rear platform. Also, the gripman has a pedal-operated brake which works a similar system l on the front wheels, and the pedal. which is directly behind him, is of sufficient site to allow him to stand on it with both feet and even jump up and down it things start to get out of hand. At the same time, the cable itself can be considered as a brake because the car is always taken down hill with the grip applied, so, theoretically. all accidents take place at exactly 9.5 mph. Although controlling the car on level ground is a simple 2-lever operation, it becomes much more complicated while ascending and descending hills. Then the other braking systems have to be brought into play, and the bell rope has to be pulled constantly, because if traffic gets in the way while ascending, restarting is impossible on a steep hill, and the car has to be backed down to the next intersection. And, while all this is going on, the gripman is frequently engaged in bawling out in Billingsgate a cab driver who is trying to make a turn in the path of the car. At speed, if 9.5 mph can he considered speed, the handling left little to be desired. Despite the height of the vehicle, it was totally unaffected by cross winds and its cornering was quite flat and without a trace of oversteer, although we did notice a certain amount of swaying when making the difficult turn from Powell Street into Jackson under full power. The thing that impresses one immediately about a cable car, and which differentiates it from all other road vehicles. is the manner in which it totally disregards gradients. The cable speed is 9.5 mph and once the car is locked to the cable it progresses steadily on the level at 9.5 mph. Ascends San Francisco’s gradients at 9.5 mph, descends the other side, still at 9.5 mph. and one gets the impression that if the cable went up the side of the Ferry Building, that’s where the cable car would go–exactly at 9.5 mph. A Powell-Hyde cable car is about to descend the Hyde Street hill, the steepest hill on the cable car system with a 21% grade. Both descending the hill and ascending it, the cable car will travel at the same speed–exactly at 9.5 mph. Road & Track selected the compact Powell Street cable car to road test. Here a Powell car No. 501 is at the Market Street end of the line, where the ability to turn in its own length (using a turntable) is occurring. Power for the about-face is furnished by the crew, and at that time the crew was usually aided by passengers. As a basic package, the Powell car, due mainly to purity of its original design, has remained unchanged since its conception. The total lack of model changes, or even recognition changes, is most refreshing, and we were pleased to note that the factory has steadfastly refused over the years to introduce the almost inevitable Gran Turismo model. Designed to accommodate 25 seated passengers and at least another 35 standing, hanging or dangling on the outside, we felt that the coachbuilt body did present a rather squarish appearance in what we refer to as "British perpendicular," although it is obviously a well conceived approach to the particular problem of transporting passengers in urban districts. Admittedly, the frontal area by today’s standards is excessive, but with an unladen weight of eight tons, a maximum speed of 9.5 mph and 750 hp available, who cares about the frontal area? In obtaining information for our data panel, we have endeavored to follow as closely as possible the procedure used when testing vehicles of less exotic design. 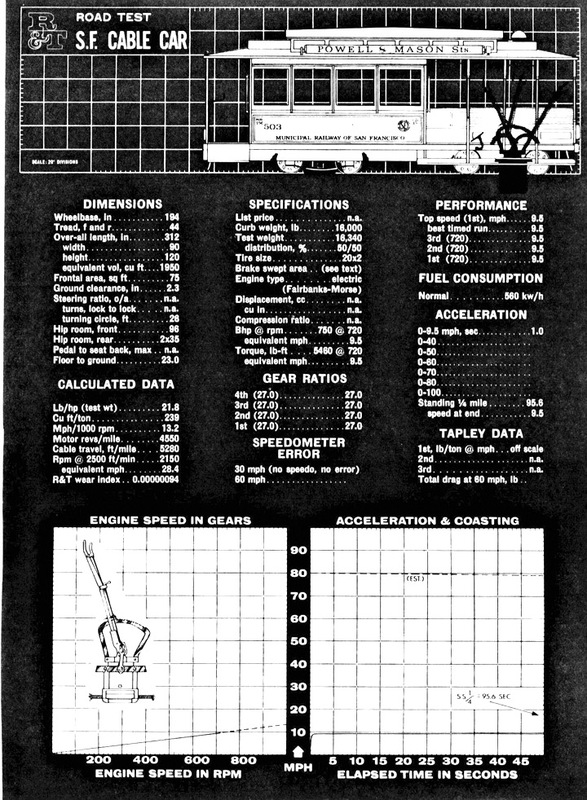 For instance, computing the all-important R&T wear index presented a problem but, by accepting the proven longevity of the vehicle, assuming that oil can lubrication would be carried out at the specified intervals, and taking into account certain variables, we were able to arrive at figure of 0.00000094, which we feel is fairly accurate. On the other hand, we were unable to obtain a coasting figure because we released the grip at 9.5 mph and, like Ol’ Man River, the car just kept rolling along. In an age of conformity, the San Francisco cable car bristles with novel design features. Being upholstered throughout in wood, it can be criticized from the standpoint of passenger comfort, and its maximum speed is low by today’s standards, but for sheer simplicity, durability, ease of maintenance and ability to climb hills, it is without peer, and we are confident that it will stand the test of time. 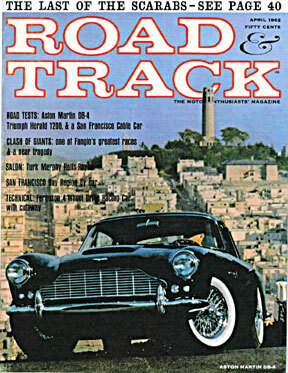 Copyright 1962 by Road and Track Magazine. All rights reserved.